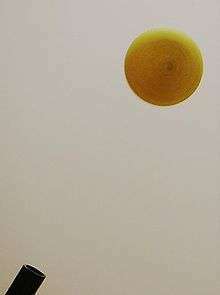 A spinning ping pong ball is held in a diagonal stream of air by the Coandă effect. The ball "sticks" to the lower side of the air stream, which stops the ball from falling down. The jet as a whole keeps the ball some distance from the jet exhaust, and gravity prevents it from being blown away. The Coandă effect (/ˈkwɑːndə/ or /ˈkwæ-/) is the tendency of a fluid jet to stay attached to a convex surface. A better definition has been provided by Henri Coandă in different patents and have been reported by Merriam Webster dictionary: "the tendency of a jet of fluid emerging from an orifice to follow an adjacent flat or curved surface and to entrain fluid from the surroundings so that a region of lower pressure develops." 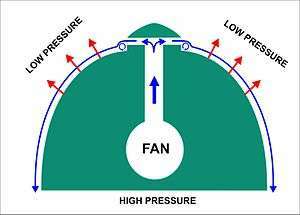 The pressure effect, which is usually not indicated, is fundamental for the comprehension of the Coandă effect. The principle was named after Romanian aerodynamics pioneer Henri Coandă, who was the first to recognize the practical application of the phenomenon in aircraft development. A hundred years later, Henri Coandă identified an application of the effect during experiments with his Coandă-1910 aircraft, which mounted an unusual engine he designed. The motor-driven turbine pushed hot air rearward, and Coandă noticed that the airflow was attracted to nearby surfaces. In 1934 Coandă obtained a patent in France for a "method and apparatus for deviation of a fluid into another fluid." The effect was described as the "deviation of a plain jet of a fluid that penetrates another fluid in the vicinity of a convex wall." The first official documents that explicitly mention the Coandă effect were two 1936 patents by Henri Coandă. This name was accepted by the leading aerodynamicist Theodore von Kármán, who had with Coanda a long scientific relationship on aerodynamics problems. A diagram of a generic engine that harnesses the Coandă Effect to generate lift (or forward motion if tilted 90° on its side). The engine is approximately bullet or inverted bowl shaped, with fluid being expelled horizontally from a circular slit near the top of the bullet. A small step at the lower edge of the slit ensures that a low pressure vortex develops immediately below the point where the fluid exits the slit (see image 5 in the illustration on the left). From there on the Coandă effect causes the sheet of fluid to cling to the curved outer surface of the engine. The entrainment of the ambient fluid into the stream flowing over the bullet, causes a low pressure area above the bullet (see images 1-5 on the left) . This, together with the ambient ("high") pressure below the bullet causes lift, or, if mounted horizontally, forward motion in the direction of the apex of the bullet. 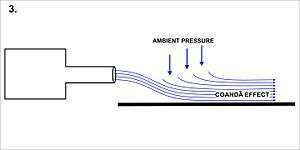 A jet of air will entrain molecules of air from its immediate surroundings, causing a "tube," or "sleeve," of low pressure around the jet (see image 1 in the diagram on the left). 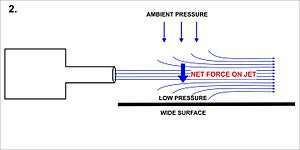 Ambient air from around this tube of low pressure will exert a force on the jet, which, when seen in cross section, is equal in all directions. The jet will therefore not deviate from moving in a straight line. However, if a solid surface is placed close, and approximately parallel, to the jet (see image 2 in the diagram on the left), the entrainment (and therefore removal) of air from between the solid surface and the jet causes a reduction in air pressure on that side of the jet that cannot be neutralized as rapidly as the low pressure region on the "open" side of the jet. 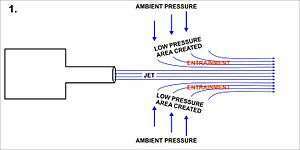 The pressure difference across the jet causes the jet to deviate towards the nearby surface, and then to adhere to it (image 3 on the left). The jet will then adhere to the surface even if it is curved (image 4 on the left), because each (infinitesimally small) incremental change in direction of the surface will bring about the effects described for the initial bending of the jet towards the surface. If the surface is not too sharply curved, the jet can, under the right circumstances, adhere to the surface even after flowing 180° round a cylindrically curved surface, and therefore be traveling in a direction opposite to its initial direction. The forces that cause these changes in the direction of flow of the jet cause an equal and opposite force on the surface along which the jet flows. These Coandă effect induced forces can be harnessed to cause lift and other forms of motion, depending on the orientation of the jet and the surface to which the jet adheres. A small "lip" on the surface at the point where the jet starts to flow over that surface (see image 5 in the diagram on the left), enhances the initial deviation of the direction of flow of the jet, and its subsequent adherence to the surface. This results from the fact that a low pressure vortex forms behind the lip, promoting the dip of the jet towards the surface. The Coandă effect can be induced in any fluid, and is therefore equally effective in water as in air. Early sources provide information needed to derive a detailed explanation of the Coandă effect and its limits. Coandă effect may occur along a curved wall either in a free jet or a wall jet. To compare experience with a calculation we refer to a two-dimensional plane wall jet of width h along a circular wall of radius r. A wall jet follows a flat horizontal wall, say of infinite radius, without separation because the surface pressure as well as the external pressure in the mixing zone is everywhere equal to the atmospheric pressure and the boundary layer does not separate from the wall. Measurements of surface pressure along a circularly curved wall of radius r = 12 cm, deflecting a turbulent jet of air (Reynolds number = 106) of width h. The pressure begins to fall before the origin of the jet, due to local effects at the point of exit of the air from the nozzle which creates the jet. If the h/r ratio (ratio of the width of the jet to the radius of curvature of the wall) is less than 1.7, a true Coandă effect is observed, with the wall pressures along the curved wall remaining at this low (sub-ambient pressure) level until the jet reaches the end of the wall (when the pressure rapidly returns to ambient pressure). If the h/r ratio is more than 1.7, only the local effects occur at the origin of the jet, after which the jet immediately separates from the wall, and there is no Coandă effect. Experiments by M. Kadosch and J. Liermann in M. Kadosch's laboratory, SNECMA. With a much smaller radius (12 centimeters in the image on the right) a transverse difference arises between external and wall surface pressures of the jet, creating a pressure gradient depending upon h/r, the relative curvature. This pressure gradient can appear in a zone before and after the origin of the jet where it gradually arises, and disappear at the point where the jet boundary layer separates from the wall, where the wall pressure reaches atmospheric pressure (and the gradient becomes zero). 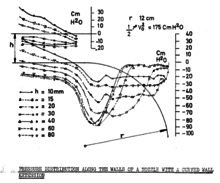 Experiments made in 1956 with turbulent air jets at a Reynolds number of 106 at various jet widths (h) show the pressures measured along a circularly curved wall (radius r) at a series of horizontal distance from the origin of the jet (see the diagram on the right). Above a critical h/r ratio of 1.7 only local effects at the origin of the jet are seen extending over a small angle of 9° along the curved wall. The jet then immediately separates from the curved wall. A Coandă effect is therefore not seen. However, if the h/r ratio is smaller than the critical value of 1.7, the lower than ambient pressure measured on the wall seen at the origin of the jet continues along the wall (till the wall comes to an end - see diagram on the right). This is a true Coandă effect as the jet clings to the wall as in a conventional wall jet. A calculation made by L. C. Woods in 1954 of an inviscid flow along a circular wall shows that an inviscid solution exists with any curvature h/r and any given deflection angle up to a separation point on the wall, where a singular point appears with an infinite slope of the surface pressure curve. Introducing in the calculation the angle at separation found in the preceding experiments for each value of the relative curvature h/r, the image here was recently obtained, and shows inertial effects represented by the inviscid solution: the calculated pressure field is similar to the experimental one described above, outside the nozzle. The flow curvature is caused exclusively by the transverse pressure gradient, as described by T. Young. Then, viscosity only produces a boundary layer along the wall and turbulent mixing with ambient air as in a conventional wall jet—except that this boundary layer separates under the action of the difference between the finally ambient pressure and a smaller surface pressure along the wall. According to Van Dyke, quoted in Lift (force) Wikipedia article, §10.3, the derivation of his equation (4c) also shows that the contribution of viscous stress to flow turning is negligible. 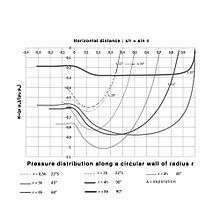 An alternative way would be to calculate the deflection angle at which the boundary layer subjected to the inviscid pressure field separates. A rough calculation has been tried that gives the separation angle as a function of h/r and the Reynolds number: The results are reported on the image, e.g., 54° calculated instead of 60° measured for h/r = 0.25. More experiments and a more accurate boundary layer calculation would be desirable. Other experiments made in 2004 with a wall jet along a circular wall show that Coandă effect does not occur in a laminar flow, and the critical h/r ratios for small Reynolds numbers are much smaller than those for turbulent flow. down to h/r=0.14 if Re=500 and h/r=0.05 if Re=100. 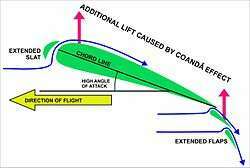 The Coandă effect has important applications in various high-lift devices on aircraft, where air moving over the wing can be "bent down" towards the ground using flaps and a jet sheet blowing over the curved surface of the top of the wing. The bending of the flow results in aerodynamic lift. The flow from a high speed jet engine mounted in a pod over the wing produces increased lift by dramatically increasing the velocity gradient in the shear flow in the boundary layer. In this velocity gradient, particles are blown away from the surface, thus lowering the pressure there. Closely following the work of Coandă on applications of his research, and in particular the work on his "Aerodina Lenticulară," John Frost of Avro Canada also spent considerable time researching the effect, leading to a series of "inside out" hovercraft-like aircraft from which the air exited in a ring around the outside of the aircraft and was directed by being "attached" to a flap-like ring. This is as opposed to a traditional hovercraft design, in which the air is blown into a central area, the plenum, and directed down with the use of a fabric "skirt." Only one of Frost's designs was ever built, the Avrocar. The VZ-9 AV Avrocar (often listed as VZ-9) was a Canadian vertical takeoff and landing (VTOL) aircraft developed by Avro Aircraft Ltd. as part of a secret United States military project carried out in the early years of the Cold War. The Avrocar intended to exploit the Coandă effect to provide lift and thrust from a single "turborotor" blowing exhaust out the rim of the disk-shaped aircraft to provide anticipated VTOL-like performance. In the air, it would have resembled a flying saucer. Two prototypes were built as "proof-of-concept" test vehicles for a more advanced U.S. Air Force fighter and also for a U.S. Army tactical combat aircraft requirement. 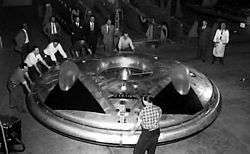 Avro's 1956 Project 1794 for the US military designed a larger-scale flying saucer based on the Coandă effect and intended to reach speeds between Mach 3 and Mach 4. Project documents remained classified until 2012. The effect was also implemented during the U.S. Air Force's AMST project. Several aircraft, notably the Boeing YC-14 (the first modern type to exploit the effect), NASA's Quiet Short-Haul Research Aircraft, and the National Aerospace Laboratory of Japan's Asuka research aircraft have been built to take advantage of this effect, by mounting turbofans on the top of the wings to provide high-speed air even at low flying speeds, but to date only one aircraft has gone into production using this system to a major degree, the Antonov An-72 "Coaler." The Shin Meiwa US-1A flying boat utilizes a similar system, only it directs the propwash from its four turboprop engines over the top of the wing to generate low-speed lift. More uniquely, it incorporates a fifth turboshaft engine inside of the wing center-section solely to provide air for powerful blown flaps. The addition of these two systems gives the aircraft an impressive STOL capability. A diagram of the use of slats and flaps to increase the maximum lift coefficient of an airfloil. The extra lift coefficient is caused by the Coandă effect as the air is diverted through the openings in the wings caused by the extended slats and flaps. Extended slats and flaps are used on commercial aircraft on landing and taking off; but are also used to great effect on fighter aircraft to allow slow airspeeds when necessary. This is not an engineering drawing, but a somewhat exaggerated diagram to emphasize the major points. The McDonnell Douglas YC-15 and its successor, the Boeing C-17 Globemaster III, also employ the effect. 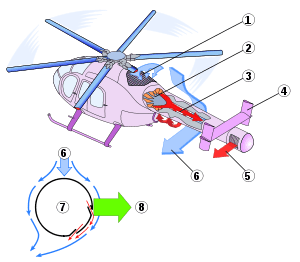 The NOTAR helicopter replaces the conventional propeller tail rotor with a Coandă effect tail (diagram on the left). A milestone in the direction of a better understanding of Coandă effect has been the large scientific literature produced by ACHEON EU FP7 project  This project about a particular symmetric nozzle has allowed an effective modeling of Coandă effect by Trancossi et al.,. This model has been validated and relaborated by Das at al, Subhash  by assuming a more complex turbulence models and by Sunol. This activity has led Trancossi to define precise design rules for the design of innovative STOL aircraft configurations, and Das to a better and improved setup of the design of the novel UAS concept. Work begun by Trancossi has been cited as a key reference in further research by Dragan in the turbomachinery sector, with the objective of better optimizing the shape of rotating blades by Rumanian Comoti Research Centre's work on turbomachinery. An important practical use of the Coandă effect is for inclined hydropower screens, which separate debris, fish, etc., otherwise in the input flow to the turbines. Due to the slope, the debris falls from the screens without mechanical clearing, and due to the wires of the screen optimizing the Coandă effect, the water flows though the screen to the penstocks leading the water to the turbines. The Coandă effect is used in dual-pattern fluid dispensers in automobile windshield washers. The operation principle of oscillatory flowmeters also relies on the Coandă phenomenon. The incoming liquid enters a chamber that contains two "islands." Due to the Coandă effect, the main stream splits up and goes under one of the islands. This flow then feeds itself back into the main stream making it split up again, but in the direction of the second isle. 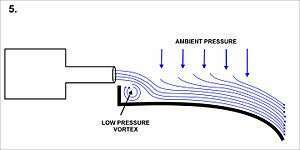 This process repeats itself as long as the liquid circulates the chamber, resulting in a self-induced oscillation that is directly proportional to the velocity of the liquid and consequently the volume of substance flowing through the meter. A sensor picks up the frequency of this oscillation and transforms it into an analog signal yielding volume passing through. In air conditioning, the Coandă effect is exploited to increase the throw of a ceiling mounted diffuser. 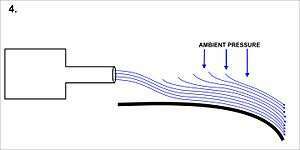 Because the Coandă effect causes air discharged from the diffuser to "stick" to the ceiling, it travels farther before dropping for the same discharge velocity than it would if the diffuser was mounted in free air, without the neighbouring ceiling. Lower discharge velocity means lower noise levels and, in the case of variable air volume (VAV) air conditioning systems, permits greater turndown ratios. Linear diffusers and slot diffusers that present a greater length of contact with the ceiling exhibit a greater Coandă effect. In cardiovascular medicine, the Coandă effect accounts for the separate streams of blood in the fetal right atrium. It also explains why eccentric mitral regurgitation jets are attracted and dispersed along adjacent left atrial wall surfaces (so called "wall-hugging jets" as seen on echocardiographic color-doppler interrogation). This is clinically relevant because the visual area (and thus severity) of these eccentric wall-hugging jets is often underestimated compared to the more readily apparent central jets. In these cases, volumetric methods such as the proximal isovelocity surface area (PISA) method are preferred to quantify the severity of mitral regurgitation. In medicine, the Coandă effect is used in ventilators. In meteorology, the Coandă effect theory has also been applied to some air streams flowing out of mountain ranges such as the Carpathian Mountains and Transylvanian Alps, where effects on agriculture and vegetation have been noted. It also appears to be an effect in the Rhone Valley in France and near Big Delta in Alaska. In Formula One automobile racing, the Coandă effect has been exploited by the McLaren, Sauber, Ferrari and Lotus teams, after the first introduction by Adrian Newey (Red Bull Team) in 2011, to help redirect exhaust gases to run through the rear diffuser with the intention of increasing downforce at the rear of the car. Due to changes in regulations set in place by the FIA from the beginning of the 2014 Formula One season, the intention of redirecting exhaust gases to use the Coandă effect have been negated, due to the mandatory requirement that the car exhaust must not have bodywork directly behind the exit for use of aerodynamic effect. In fluidics the Coandă effect was used to build bistable multivibrators, where the working stream (compressed air) stuck to one curved wall or an other and control beams could switch the stream between the walls. The Coandă effect can be demonstrated by directing a small jet of air upwards at an angle over a ping pong ball. The jet is drawn to and follows the upper surface of the ball curving around it, due to the (radial) acceleration (slowing and turning) of the air around the ball. With enough airflow, this change in momentum is balanced by the equal and opposite force on the ball supporting its weight. This demonstration can be performed using a vacuum cleaner if the outlet can be attached to the pipe and aimed upwards at an angle. An effective theoretical demonstration of the Coandă effect and of the possibility of modeling it is due to Trancossi who has defined a useful mathematical model that allow to produce a good prediction of different cases of Coanda adhesion of a fluid over a convex surface in the range 10–100 m/s. With respect to other models, Trancossi has developed a complete analytical description of the phenomena, which is strictly based on a theoretical approach and has not considered the simplification of assuming an irrotational fluid model. The model considers a complete solution based on Bernulli Law and clearly demonstrates analitycally the existence of the adhesion phenomena in two cases a fluid stream exiting from a nozzle and a synthetic jet formed by two streams improving former theoretical demonstrations by Newman, and Bradshaw. This methods present a particular robustness by including the possibility of introducing different and more sophisticated turbolence models. Another demonstration is to direct the air flow from, e.g., a vacuum cleaner operating in reverse, tangentially past a round cylinder. A waste basket works well. The air flow seems to "wrap around" the cylinder and can be detected at more than 180° from the incoming flow. Under the right conditions, flow rate, weight of the cylinder, smoothness of the surface it sits on, the cylinder actually moves. Note that the cylinder does not move directly into the flow as a misapplication of the Bernoulli effect would predict, but at a diagonal. The effect can also be seen by placing a can in front of a lit candle. If one blows directly at the can, the air bends around it and extinguishes the candle. The engineering use of Coandă effect has disadvantages as well as advantages. In marine propulsion, the efficiency of a propeller or thruster can be severely curtailed by the Coandă effect. The force on the vessel generated by a propeller is a function of the speed, volume and direction of the water jet leaving the propeller. Under certain conditions (e.g., when a ship moves through water) the Coandă effect changes the direction of a propeller jet, causing it to follow the shape of the ship's hull. The side force from a tunnel thruster at the bow of a ship decreases rapidly with forward speed. The side thrust may completely disappear at speeds above about 3 knots. If the Coandă effect is applied to symmetrically shaped nozzles, it presents resonation problems. Those problems and how different spins couple has been analyzed in depth by Shyam, Pascoa et al. ↑ Tritton, D.J., Physical Fluid Dynamics, Van Nostrand Reinhold, 1977 (reprinted 1980), Section 22.7, The Coandă Effect. ↑ Coanda, H. "US Patent# 2,052,869." Device for Deflecting a Stream of Elastic Fluid Projected into an Elastic Fluid (1936). 1 2 3 4 5 Reba, Imants (June 1966). "Applications of the Coanda effect". Scientific American. 214 (6): 84–921. doi:10.1038/scientificamerican0666-84. ↑ Yenne 2003, pp. 281–283. ↑ Milberry 1979, p. 137. ↑ ACHEON-Aerial Coanda High Efficiency Orienting jet Nozzle, European Commission, Project reference: 309041, Funded under: FP7." TRANSPORT (2011). ↑ Das, Shyam, et al. "Numerical modeling of Coanda effect in a novel propulsive system." The International Journal of Multiphysics 8.2 (2014): 181-202. ↑ Subhash, Maharshi, and Antonio Dumas. "Computational study of Coanda adhesion over curved surface." SAE International Journal of Aerospace 6.2013-01-2302 (2013): 260-272. ↑ Suñol, A., D. Vucinic, and S. Vanlanduit. "CFD Modelling of the Coanda Based Thrust Vectoring Nozzle." Engineering Applications of Computational Fluid Dynamics. Springer International Publishing, 2015. 73-84. ↑ Trancossi, Michele. Design of ACHEON thrust and vector propulsion system. No. 2015-01-2425. SAE Technical Paper, 2015. ↑ Trancossi, Michele, et al. "A new aircraft architecture based on the ACHEON Coanda effect nozzle: flight model and energy evaluation." European Transport Research Review 8.2 (2016): 1-21. ↑ Trancossi, Michele, et al. Preliminary implementation study of ACHEON thrust and vector electrical propulsion on a STOL light utility aircraft. No. 2015-01-2422. SAE Technical Paper, 2015. ↑ Trancossi, Michele, et al. Multifunctional unmanned reconnaissance aircraft for low-speed and STOL operations. No. 2015-01-2465. SAE Technical Paper, 2015. 1 2 Das, Shyam S., et al. "Computational Fluid Dynamic Study on a Novel Propulsive System: ACHEON and Its Integration with an Unmanned Aerial Vehicle (UAV)." Journal of Aerospace Engineering 29.1 (2015): 04015015. ↑ Hydropower in the U.S., Coandă effect used in debris screen design. ↑ US 4210283 "Dual pattern windshield washer nozzle"
↑ Spitzer, David W. "Industrial Flow measurement." Instrument Society of America, 1990. ↑ Ashrafian H. The Coandă effect and preferential right atrial streaming. Chest. 2006 Jul;130(1):300. ↑ Newman, B. G., (1969) “The Prediction of Turbulent Jets and Wall Jets,” Canadian Aeronautics and Space Journal, Vol. 15, pp. 287-305. ↑ Newman, B. G., (1961), “The Deflexion of Plane Jets by Adjacent Boundaries- Coanda Effect,” Boundary Layer and Flow Control, edited by Lachmann, G. V., Vol. 1, Pergamon Press, Oxford, pp. 232-264. ↑ Bradshaw, P., (1973) “Effects of Streamline Curvature on Turbulent Flow,” AGARDograph, AGARDograph AG-169.